Bear testimony of the truths I know more consistently to my family and friends. I am going to try to and have some insights each Sunday. Moments of gratitude, awakenings, tender mercies, or simply testifying. Because my blog is now a "book of remembrance" to pass along to my posterity in addition to verbally expressing to my children what I know, they will have a written and recorded record. Because Sunday is my day of rest and worship, what better time? You will have significant experiences. I hope that you will write them down and keep a record of them, that you will read them from time to time and refresh your memory of those meaningful and significant things. Some may be funny. Some may be significant only to you. Some of them may be sacred and quietly beautiful. Some may build one upon another until they represent a lifetime of special experiences. Here are the thoughts that fill my mind today. I have been reading in the Book of Mormon the book of Helaman this week. The coming of the Lord was soon at hand and the people were ripening for destruction. Sound familiar? At this point the prophet Nephi was pleading with his people to repent and believe in Christ. Yea, did [Moses] not bear record that the Son of God should come? 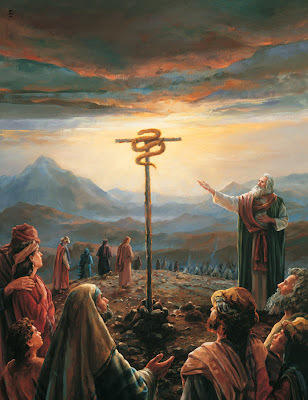 And as he lifted up the brazen serpent in the wilderness, even so shall he be lifted up who should come. And as many as should look upon the Son of God with faith, having a contrite spirit, might live, even unto that life which is eternal. It was as easy as looking at the brass serpent and believing and the people could have had life and been healed. But many chose to disregard this, because of the simplicity. It is so much the same with me. I cannot dismiss the simple truth of looking upon the Son of God to live. It translates to every moment of every day. How I chose to respond to my children when I am tired and busy. What I do when my son is pulling on my finger begging me to go somewhere with him, as he struggles to communicate. How much of the day do I have a smile on my face. My response to a hungry husband who sees absolutely no food in the house that he could possibly eat. Thinking before I react when my children refuse to eat the dinner I so painstakingly prepared for them in accordance with our chosen dietary principles. Only nice people will be found living with the Savior in the next life. Those who try every moment of every day to act as he did will be there. Eventually it becomes who we are. And his light shines from within us. I testify the more we try, the more we remember, Him, the more he will write his names upon our hearts and we become as he is. It is as simple as being good and kind and selfless. It is true in my life. It gets easier, not harder the more we try. Several months ago I was putting the children to bed. It seemed like Ellery had called or come down at least 20x. I can't remember where Brent was or what he was doing. My patience had worn thin. The last few times telling her to go to bed was about it for me. She called down again. I was ready to snap. Then that familiar quiet voice of the Holy Ghost said go up, with gentleness. Try a different way. I went upstairs and decided to take a few more minutes and snuggle in close. We shared a special 5 minutes that I might have missed, had I reacted the way I felt. I even felt a little sick, thinking about what she said to me, the tenderness. Those are the moments when I feel closest to Him. The easiness of the way. I could have ignored the prompting, because it was so simple. Easy. I chose to listen and felt Him there. Since that time I have gained more moments that previously I may have let slip away. I have missed some too. The rewards are so rich. I love the inspiration that comes by writing down our experiences. I think I like my new Sunday tradition. Thank you so much, Becca! I snap way too often, and have never thought of it this way - the easiness of the way. I'm going to keep this in mind as I start my week and hopefully capture some sweet moments with my boys that I might have otherwise missed! Young Coconuts and Virgin "Crackers"
Refined Sugar Free Chocolate "Chips"